Another wee break from the FCs. Colour: gold. Nose: sultanas, figs, caramelising brown sugar, lemon peel, various herbal teas, pot pourri, tobacco leaf. Classical, straightforward and very good! Perhaps a hint of more tertiary things like putty and soft waxes after a while. A lean and light earthiness as well. Mouth: earthy, lightly sooty and gently herbal. Caramel, molten toffee chews, millionaire shortbread, cloves, liquorice and muesli. Really lovely! Some soft stewed green fruits such as apple and pear crumble drizzled with custard and golden syrup. A few bits of milk chocolate melted in. Finish: long and full of soft earth, tobacco, sultanas, milk chocolate and stewed fruits. Comments: I really liked this one! SGP: 661 - 89 points. Colour: orangey amber. (I know my colour descriptions are the height of lame) Nose: buttery fudge, chocolate orange, pocked-warmed toffee chews, Werther’s Originals, Dundee cake, glace cherries, buttermints, strawberry candy floss and liquorice. Basically and old fashioned confectionary. With a little time the sugar eventually boils off and you get to things like moss, ferns, sage, damp earth, jasmine and rather clear notes of verbena and wormwood. Really excellent! With water: still hugely fudgey with chocolate eclair, strawberry jam, marzipan and hessian. Mouth: big hearty sherry! Lots of chewy toffee, dark fruits, walnut wine, camphor, cough medicines, old leathery sherry notes, salted caramel and rancio. Hints of white balsamico, black truffle, old leather, toasted pecans, Nutella and some green Chartreuse. With water: more nutty - walnuts again and brazil nuts to be precise - and mint leaf, tea tree oil and lemon peel. Big, emphatic but not overpowering sherry remains throughout. Finish: long, rather sooty and leathery with bitter cocoa, clean rubber and maraschino. Comments: There’s an element of rubber in the finish that I think some people would be put off by, but I find it closer to this ‘natural dirtiness’ rather than an off note. Globally a really excellent sherry bomb I’d say. SGP: 671 - 89 points. Colour: rosewood. Nose: the height of elegance. A wafting, leafy, chocolatey sherry profile. Lots of expensive cocoa, mint leaf, pu erh tea, herbal extracts, verbena, yellow Chartreuse, fig paste, rancio, salted almonds and wee touches of things like fennel and quince jelly. Really superbly fresh, complex and expressive. Wild strawberry, raspberry jam, cranberry juice, treacle, black tea. Lots happening. Mouth: great, old school, earthy, leathery, fruity sherry. Lots of dark fruit stewed in cognac, black pepper, game meats, aged pinot noir, old earthen wine cellars, mushroom powder, umami paste and crystallised fruits. Toasted pine cones, precious hardwood resins, old ointments, cough medicine, natural tar extracts and in the background things like crushed digestive biscuits, chamomile and green tea. Finish: long and gently drying, lots of coal dust, bitter lemon, black olives, toasted cereals, liquorice and bitter chocolate. Comments: A superb and very old school sherry cask. Has this big, bassy earthy and chocolatey profile running throughout with these rancio touches that I just adore in sherried whiskies. SGP: 671 - 91 points. Colour: light amber. Nose: damp leaves, soft earthiness, a curious hint of bubblegum, some chocolate bittermints and then notes of barley water, bailed hay and warm draff - we’re getting close to the raw ingredients now. Things like lime jelly, lemon curd, distant notes of vapour rub, café latte, bourbon biscuits and sweet flapjacks. With water: perhaps a tad more cohesive now. Straightforward leathery notes with trodden ferns, damp earth and other petrichor characteristics. Notes of tea, yellow flowers, wild mint and nettles. Mouth: caramelised sugar on brown bread. Garibaldi biscuits, baked bananas, lime oil, strawberry laces, red liquorice, hessian, cloves, hummus and some rolling tobacco. Very good and nicely ‘scattered’ in profile, if you see what I mean? With water: blossom, lemon peel, light hessian notes, rapeseed oil, pineapple syrup, thyme and some lighter cereal, toasty notes. Finish: good length and similarly broad in scope with bitter teas, chamomile, herbal extracts, pine cones, sourdough, salted butter, sage and soda bread. Comments: A real jester of a whisky. A tad all over the place in some senses, but that only adds to the charm in this instance and ends up as a definite asset. There’s lots going on, none of it bad. SGP: 561 - 88 points. SGP: 451 - 84 points. Colour: deep gold. Nose: rather brandyish with these initial notes of young cognac, some hedgerow earthiness, a little greenery such as grass and nettles and getting rounder and gentler with emerging notes of sultana and cocoa. Some pithy lemon notes and eventually more typical notes of seed breads and cereals. With water: much more toasty, bready and cereal driven now. Things like popcorn, sunflower seeds and a slight but very lovely touch of lychee. Mouth: white chocolate, some runny honey, hints of damson jam, mead, buttered toast and some pollens and floral notes. Indeed, it’s these more fragrant aspects such as meadow flowers, chamomile and chopped herbs which develop more over time. With water: works well! Water brings out more of these toasty, lightly citrus and cereal tones. Some more greenery, a little lamp oil and boot polish and some berry fruits. Finish: good length, some tiny hints of rubber but otherwise clean, earthy, slightly raisiny, toasty and getting increasingly meaty. Comments: Very good. Although, I think water is obligatory here. SGP: 561 - 85 points. Colour: deep rosewood. Nose: hot strawberry jam, black coffee, burned nuts and also, underneath, a pretty heady mix of sawdust and pencil shavings. Some black grapes, wee hints of matchbox, rosemary and some pretty hefty meaty notes of Bovril and beef stock. With water: it’s funny how, even with this turbo charged sherry and high abv, it still develops in a kind of typical way with the addition of water. That is to say towards breads, golden syrups, sultanas, cinnamon and some rather intense herbal extracts. Things like tarragon stems and something almost like gentian root and dry earth. Mouth: as the nose would suggest this is a more aggressive style. Hot sandalwood, BBQ briquettes, pencil shavings, clove oil, liquorice, mint liqueur, cherry syrup and even some irn bru sweeties. Lots of black tea, bitter chocolate, strong espresso and pomegranate molasses. Pot pourri and grapefruit pith as well. Pretty intense stuff! With water: again the development is pretty typical. All roasted nuts, seeds, fruit cake, dates, prune eau de vie and cherry kirsch. Still some rather persistent tannins and pencil shaving notes nibbling around the edges. Finish: long but slightly on the bitter side, as expected. Some pretty dark chocolate, black tea, bitter herbal extracts and soot. Comments: Pleasure and pain in various interchanging measures. Another one that will delight sherry heads, but, for this wee taster, I’m afraid it just lacks a bit of balance. Also, I really think you can feel the difference between these younger, modern seasoned ‘sherry’ casks. Not that this is a bad one, just you feel the activity of the wood quite profoundly. SGP: 471 - 85 points. Colour: teak. Nose: cherry flavoured cough medicine, rye bread, cinnamon bark, dried geraniums, tar extract. Quite a departure from the previous ones. A big, emphatic sooty earthiness, soy sauce, peppered beef jerky, turmeric and even some farmy hints of bailed hay and straw. Quite impressive. In time there’s also crispy bacon and boot polish. With water: not a huge sea change. More of a gentle drift towards strawberry jam, a little mocha, plum crumble and darjeeling tea. The earthiness takes on a fibrous edge as well - almost like old rope and hessian cloth. Mouth: cherry liqueurs, spiced cassis, star anise, five spice, strong miso broth, young madeira, clotted cream with strawberries and red current puree. There’s also these big, intense herbal notes such that nod towards Jägermeister and Unicum. With water: cherry cola syrup, birch beer, lime cordial, dates, prune juice, walnut liqueur, various shades of dried herbs. The meatiness is still present but it’s more muttony now. Finish: long, deeply earthy and treading a tightrope between bitter herbal extracts, dry earth, black pepper, strong dark teas and chocolate. Rather impressively it never manages to succumb too far in any one direction but keeps its head. Comments: Impressive I have to say. It lacked the woodiness of the 02 and possessed something more complex, charming and a few more interesting shades of fruit, enough to propel it into another league in my book. An excellent sherry monster and a perfect one to finish this marathon run of Family Casks on. SGP: 571 - 90 points. Colour: deep gold. Nose: nice! Typical easy fruitiness and sweetness. Lots of toffee apples, sultanas, prunes, green banana, light pastries and wee notes of pollen, sunflower oil and orange bitters. Surprisingly accessible for 60%. Continues with nice notes of cocoa, red cola cubes, pears baked in calvados and a light waxy note such as canvas. Perhaps a wee hint of paprika. With water: goes pretty cloudy! Then there’s a little caraway, some orange juice and lemon jelly. Gets a tad simple with water which is a small pity. Mouth: again, it wears its strength very lightly, which I always love in cask strength whiskies. In place of that there’s this wonderful syrupy quality, lots of juicy fruits, some pineapple notes, quince, garden fruits glazed with honey, muesli, dates and cinnamon sugar. In time it evolves more towards earth, pollen, dried flowers, white pepper and toasted seeds. With water: you really feel this is a big, fatty, oily dram now that water is added. I prefer the palate with water than the nose certainly. More spices, jasmine, fruit teas, five spice, fruity red chilli, orange and coriander marmalade and some green chartreuse. Finish: good length but perhaps a bit staggery, if you see what I mean. A prickle of heat and pepper along with more earthy tones, dried fruits, aniseed and flowers. Comments: A curious one. Some parts are really excellent, such as the neat nose and much of the palate. But it seems to be a bit inconsistent with water. Maybe one of these ones that you need to pour two drams of? Now, having said all that, I still think it’s pretty excellent whisky and a rather fun wee dram. SGP: 561 - 86 points. I think this wee baby should do the trick... Colour: amber. Nose: a stodgy, leathery and leafy sherry that’s full of old cigars, walnuts, sultanas, dates and other assorted dark fruits. Wee hints of mint tea, ginger cake, hessian, nougat, dried flowers and bouquet garni simmering in stock. You could also add some fragrant citrus oils, light soy sauce and quite a bit of earthen wine cellar floor. Really quite surprisingly complex. I get the feeling it’s one of those batches that was ‘topped up’ with some older stocks. Mouth: mushrooms, leather, tobacco, raisins, a single violet, mixed dried herbs, verbena, yellow flowers, cola cubes. Quite a beautiful and elegant wee sherry profile. And surprisingly weighty for 40%. Hints of madeira cake, lemon peel and wormwood. After a while there’s coconut milk as well. Finish: not the longest but nicely peppery and earthy, a tad drying, some deeper earthy tones and a hint of sootiness and wax. Lovely richness of chocolate biscuits in the aftertaste. Comments: Better than I expected and a really perfect way to conclude this slightly overambitious delve into the Glenfarclas warehouses. It’s true that you can spot a Glenfarclas DNA between this and contemporary bottlings of the 10. But, in all honesty, I prefer this one by quite some distance. There’s a richness and a silky elegance to the sherry that is absent from most sherry cask whiskies these days. SGP: 551 - 89 points. So, what have we learned? Well, I feel that this session has only underscored what I surmised last time. Which is that the character of Glenfarclas really shifted quite distinctly around 1980. From that luscious and luxuriously fruity and opulent 1970s style to a more punchy, robust, biscuity, mineral and sometimes rather austere 1980s profile. I think you could say things even improved a little in the 1990s as the fatness of the distillate seemed to increase and the quality of the sherry casks was still good. But of course these are amateur observations based on what really only amounts to a handful of casks out of thousands across decades. I would also point out that I feel Glenfarclas is still making some excellent whiskies and still bottling some really terrific casks. The 2003 that we ended the Family Casks on was really something. It’s also probably worth noting that the scores were pretty consistent across three decades of bottlings, mostly hovering around the 88-91 range. Whether that’s due to consistency of production quality or cask selection for the Family Cask series I’m not sure. I suspect more likely the former. It also underscores the importance of distilleries like Glenfarclas that invest a little more in the future of their own single malt stocks, rather than just churning out blending fodder, or new starts rushing everything to bottle at 3 years old. The riches that you can reap at even just a couple of decades down the line are worth the effort I’d say. Look out for my next Glenfarclas session on Whiskyfun, coming sometime around January 2035. Heartfelt thanks to Dirk, who clearly knows the secret tunnel to the Glenfarclas warehouses! Colour: amber. Nose: simmering coffee, roast hazelnuts, beef stock, damp earth, morello cherries and new leather. Rather a big, punchy sherry profile, even if it is from a refill cask. But also clean, vivid and excellent I should add. Hints of walnuts and rancio in the background with some crispy bacon notes. With water: limoncello, Turkish delight dipped in milk chocolate and artisan sourdough (an early contender for Whiskyfun’s most hipster tasting description of 2019 I’d say). Mouth: lots of various jams and red fruit cordials and syrups. Red liquorice, mint leaf, figs, chopped dates in muesli, lemon infused oil, bramble liqueur. All very big, opulent and fruity with a meaty backbone underneath. Hints of golden syrup on ginger cake, cod liver oil and hessian cloth. With water: still on dark fruits but softer with notes of caramelised brown sugar, walnut oil, cured meats and balsamic. Finish: long, leathery, peppery, meaty and with plenty warming spiciness. Comments: A great cask certainly helped things along here. A pretty big, and full on Glenfarclas that sherry lovers should lap up eagerly enough. Colour: orangey amber. Nose: we’re much more on honeys, pollens, various nectars and herbs here. The sherry aspect feels much more restrained on the whole and it delivers a more tertiary and complex profile. Jamaica cake, freshly baked breads, black olive, soot, mushroom powder, bouillon - a rather umami picture emerges. However, there’s also some lovely fruitiness in the form of blood orange, orange bitters, wild strawberry and wee flourishes of things like melon and guava. Excellent stuff! Mouth: gingerbread, mint tea, various red fruit liqueurs, kirsch, blackcurrant, cafe latte, buttery shortbread and a warm seed loaf. More toasty notes, muesli, seed mix, lime zest and hint of earthy petrichor and even a touch of rancio. Really excellent. Finish: long, earthy, raisiny - the sherry aspect becomes a little louder in the aftertaste. Also prunes, lemon peel and more menthol characteristics such as eucalyptus resin and some dried herbs. Comments: I really love this kind of profile of Glenfarclas, some background sherry that quietly elevates the great, weighty distillate and builds an overall very complex and beautiful profile. SGP: 671 - 90 points. Let’s diverge from the Family Casks via Cadenhead for a brief minute... Colour: gold. 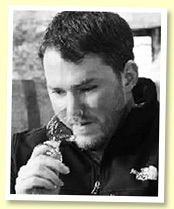 Nose: it is indeed quite a divergence from some of the more boisterous and sherry-driven official bottlings. This pure refill bourbon profile is really lovely, a mix of gently spiced custard, sponge cake, aged sweet wines, hessian, lime cordial and lemon infused olive oil. Also sunflower seeds, gentle waxiness, butter biscuits, cornflakes dusted with icing sugar and heather honey. Really lovely! With water: wow, it really starts to sing with water. These kind of slightly tropical tutti frutti notes, rosewater, lemon jelly, savoury spices, jasmine, pot pourri - swims like a champ! Mouth: spiced honeys, muesli, gooseberry jam, apple turnover with vanilla custard, spiced plum cake, greengages and milk bottle sweets. There’s also hints of green tea with lemon and some old white madeira. With water: again water really works a treat. Lots of bitter herbs mixed with pink grapefruit, quinine, bitter lemon, white pepper and truffle oil. Superb! Finish: long, taut, citrusy, herbal, sweet fruit syrups and white flowers. Comments: I love the balance and complexity in this one. Sweetness and bitterness on a seesaw and an olympic swimmer to boot! SGP: 751 - 90 points. Colour: deep bronze. Nose: different territory altogether now. We’re approaching raw sherry bomb here with these notes of light tar, prune juice, strawberry jam, bitter chocolate, espresso, walnut extract, morello cherry and unlit cigars. Big, clean, punchy, powerful and pretty excellent. With a little time it opens up further towards mineral oils and rancio with this slightly saline sherry note. Blood orange, cocktail bitters, soy sauce. Pretty excellent sherry that retains good freshness and complexity. With water: now towards old leather, shoe polish and black olive paste. Some aged game meats and pinot noir as well. Mouth: superb concentration. All on cherry wine, throat sweets, herbal medicines and extracts, eucalyptus, many kinds of tea, strawberry wine, black pepper, bitter herbal oils and earthy turmeric notes. A big swirling sherried cauldron. With water: banana bread with sultanas and cognac, black coffee, miso broth, soot and more bitter herbal notes. Hints of herbal toothpaste as well. Finish: long, increasingly bitter, peppery, more herbal, more medical and wee glimpses of red and dark fruits. Comments: Overall pretty great. Only the increasing bitterness in the finish and aftertaste prevents me from going to 90, but parts were pretty spectacular and sherry heads should only drink this in a secure location, preferably while sitting down. SGP: 572 - 89 points. Colour: deep mahogany. Nose: pure espresso, brioche, various red fruit jams and preserves, salted caramel and bitter chocolate, and then plenty salty broth and soy sauce. A leathery cloak of rancio over everything - an impression of an very old dry Madeira. The chocolatey aspect merges with the coffee note making a very syrupy mocha type of aroma. The whole thing feels dense, sticky, dark and syrupy. Pure mint essence, strawberry scented pipe tobacco and crushed cloves. With water: develops rather typically towards a breadier, more autolytic profile. Trail mix, toasted pumpkin seeds, grapefruit peel, dried lavender, shilling ales and underneath it all a remnant miso-flecked, slightly saline sherry quality. Mouth: liquid incense! Pure black pepper, old ointments, mint choc chip, eucalyptus resin, tea tree oil, more cloves, ginger, nutmeg, a little hot paprika and things like game meats and biltong. More slightly salty, nervous notes, walnut oil, expensive pu-erh tea, crystalised fruits and some Moroccan spice notes. Evolves over time in a more typical direction like dates, prune juice and fig paste. With water: leafier, earthier, more tobacco, raisins, camphor, rancio, black pepper, coal dust and cough medicine. Finish: long, leathery, peppery, chocolatey and full of bitter coffee, teas, herbal extracts and various citrus piths. Comments: Whereas the 89 had a tad too much bitterness in the end, this one really shares a lot of its DNA but just with more balance and a little more complexity. A real corker of a sherry cask. It’s the kind of bottling that I think with 20 or so years in the bottle it will be really sublime. Lucky for anyone who has one. Another brief departure from the Family Casks, but remaining within the ‘official’ stable. Colour: light gold. Nose: very orchardy to begin. Lots of fermenting hay, cider apples, perry straight from the cask (that’s pear cider), wee hints of leaf mulch and green apples stewed in butter. There’s also a few underlying cereal and muesli notes. Quite a departure from the much bigger and fuller profile of the FCs, this is a nice, more easy-going and subtle take on Glenfarclas. Some delicate golden syrup sweetness in there as well. Very pleasing. Mouth: plums, apples, pears, gooseberry, lime zest - a rather lovely gathering of orchard and other fruits. Some sultanas and buttered toast, a little sprinkle of brown sugar, a spoonful of treacle and a little darjeeling tea. The height of easiness in whisky. Finish: medium-long finish. More baked apple, hints of spiced custard, green fruits, banoffee pie and lime curd. Comments: Easy, fruity and quaffable. Yet, it also has character as well which stops it from veering into ‘generic’ territory. Colour: amber. Nose: Lovely! A big, easy, leafy and tobacco-scented sherry profile. Interesting that the sherry still has a clear and definable voice on a 4th fill - perhaps the first 3 fills were reasonably short? All very typical on raisins, sultanas, dates and the usual mix of dark fruits. Brown bread, mushrooms, damp earth and some old wine cellar notes. With a little breathing it begins to display notes of cherry blossom and strawberry laces. Very lovely. With water: more toasty notes, more seeds, freshly baked savoury pastries, some cinnamon powder. Mouth: gingerbread with lemon icing, strawberry pipe tobacco, lime leaf, mint julep, some cloves, black pepper and a more developed bready aspect as well. Fresh brown bread and croissants. Getting more and more tertiary and autolytic as time goes on; you can feel that the distillate is starting to have a much more assertive voice over and above the cask. Which, obviously, I rather like. With water: dryer, more towards soft chocolate notes, some walnuts, grist, chamois leather and pollen. Finish: long and on cereals, cocoa, black tea and a few citrus peels. Comments: There’s lots to enjoy here, not least the interplay and changing volumes between cask and distillate. However, I think it’s perhaps not quite a thrilling as some of the older FCs we’re already tried. Quality is still undeniably high though. Colour: straw. Nose: quite a departure, here you really feel the ‘refill’ character. And I have to say, it’s rather lovely. Many fresh breads, light mead notes, toasted sunflower seeds, trail mix, cashew nuts, some gloopy, grassy olive oil notes and various blossoms and wildflowers. Evolves slowly but surely towards various fruits such as green apple, gooseberry, plum and perhaps a twinge of star fruit? With water: very fresh and green now, almost youthful. Citrus pith, white pepper, bay leaf, artichoke and cut grass. Mouth: a pleasing initial touch of austerity with things like crushed aspirin and chalk. Then again this rather seed/cereal forwards profile. There’s lots of freshly chopped herbs such as parsley and chives with fresh plain butter, sunflower oil and a tiny hint of green pepper. Wee hints of leaf mulch, hessian and mocha underneath as well. With water: hints of pine, pink peppercorn, rolling tobacco, muesli, brazil nuts and bread dough. Finish: long, slightly sappy, lemony, yeasty and with resurgent very light fruit salad notes. Comments: I really enjoy this profile of Glenfarclas and this was a great cask. The only trouble is that you’re left with the feeling that, at this ABV and outturn, it was perhaps bottled too young and could have produced something really spectacular given a further decade or so of slumbering. It’s still lovely whisky though. SGP: 551 - 87 points. Colour: amber. Nose: an immediately minty and sharp sherry profile. Bananas baked in chocolate, mint julep and mint tea, golden sultanas, aged marsala, treacle pudding, dates, fig rolls, dried cranberry and hot cross buns with raisins. Really fab and quite a departure from some of the other sherried ones. With water: develops kind of as anticipated, towards freshly baked breads, creme caramel, stewed dark fruits and some generic tobacco notes. Mouth: a big invasion of earth, tobaccos, mint choc chip, raspberry jam, fig compote, sultanas soaked in cognac, apple pie and strawberry wine. There’s also some rancio, slightly salty old sherry notes and crushed walnuts. Some bitter coffee and hints of soy sauce. With water: tobacco, chocolate, balsamic, miso broth, chocolate lime sweets and dried dark fruits. Perfect! Finish: long, slightly mentholated, the perfect balance of bitter and sweet, a hint of tar and some lovely, leafy tobacco and rancio in the aftertaste. Comments: Perfect age, perfect strength, perfect sherry cask, perfect balance. A great one. SGP: 661 - 91 points. Colour: gold. Nose: a slightly brute-ish start, on ale sauce and ginger liqueur, then old cellar, pumpernickel, and a development on brownies and grenadine, with whiffs of rubber in the background and touches of geranium leaves. With water: interesting. Hand cream, fruity mushrooms, pinesap, touches of eucalyptus… This baby swims very well. Mouth (neat): Jaffa cakes everywhere at first, then rather chocolate sauce (mole) and toasted gingerbread. Some kind of spicy/sour sauce. There are echoes of sherry, where do those come from? Quite some malt too, and, perhaps, even a tiny pinhead of Marmite. With water: once again things improve, and this time we’re rather all on marmalade and orangeade plus peach jam. It loves water indeed. Finish: rather medium and rather cleaner and fruitier. More peach jam, apple compote… Comments: another one that should come with a wee free bottle of water. Angus already tried this old baby for WF a few weeks ago so we’ll do this quick, if you agree. Colour: dark amber. Nose: it’s some very earthy, almost mushroomy sherry, with touches of old pinot noir, quite a lot of liquorice, then rather notes of old rancioty brandy, furniture polish, chestnuts, dried figs, maraschino, crème de menthe… This is pretty fantastic, I have to say. With water: a plate of Caesar’s mushrooms with some old balsamico sauce and drops of proper 19th century PX. Early 20th century would do. Mouth (neat): amazing! Never too oaky, yet ridden with old pine-y balms, old-style herbal liqueurs, gentian, a touch of horseradish, black tea, walnuts… Amazing, really. With water: takes water extremely well. Many spices, embrocations, herbal teas, some bouillon, a wee touch of Bovril, blood orange juice, half a drop of artisanal raki, gentian eau-de-vie, cough syrup… Some concoction! Finish: long and drier (naturally), creamy, still amazingly fresh despite the heavy-ish profile, and rather full of liquorices (with mint, with violets, with aniseed…) Comments: I think Angus was right, this is rather brilliant. Give this whisky the Nobel Prize. All of them. Garnier are located in Normandy, in the department of Orne. Not too sure whether some pears were involved here or not. Colour: straw. Nose: aaaah! Look, I’m not really a Calvados fan, but I am a fan of this bright, fruity and deep eau-de-vie that just reeks of plain cider, with even the fizzy side and these very fresh notes of citronella and mown lawn. Touches of butterscotch from some likely American oak – but I’m probably wrong. With water: cider and older apples everywhere. This one’s close to nature and was not unsanely ‘doctored’ with newish oak. Mouth (neat): wonderful spirit, all on cider and apples, with fantastic notes of old oak, old cellar, chardonnay (yes), and… old champagne! Really! With water: yes, works. Very fresh – but of course you have to like apples and cider. Finish: long but a tiny bit too bitter and soapy for me. Not something that’s unseen in Calvados, IMHO. Otherwise, very fine. Comments: some very fine spirit indeed, you’re almost feeling like you’re at the farm. It’s rustic spirit, and yet, there’s something pretty hype. More by those good folks at 30&40. This one too was distilled in Normandy, from apples harvested in 1992. Colour: amber. Nose: oh lovely. Pear cake, tarte tatin, hops, honeysuckle, chamomile tea, and hints of Belgian trappist beer. Not that all Belgians are saints or men of the cloth, mind you, well we know some who certainly aren’t. No, no names, of course not. Mouth: not strong, but big spirit that reminds me of Mackeson’s stout that I was drinking in the very early 1980s when in Glasgow. But why am I telling you this? Also burnt apple cake, thick liqueurs, green chartreuse, oak spices… It’s really very heavily concentrated, with very spicy notes of French oak. Caraway and clove. Finish: long, rather thick and very spicy. Comments: excellent, richer than the Garnier, but perhaps a little heavy as far as flavours are concerned. Great Calvados nonetheless. Some funny stuff I’ve found at Master of Malts’ a while ago. No one’s ever heard of some ‘Fine Bordeaux Brandy’ in France, let alone of one brand called ‘Thompson’s’. Thompson, how very French indeed – yeah I know many names and families in Bordeaux are either Dutch or Irish. What’s a little unclear is whether this is really a ‘fine’ (like say cognac, so ex-wine) or a ‘marc’ (so ex-spent grapes after pressing). Colour: deep amber. Nose: hey, but this is nice! Reminds of the best old brandies de Jerez, only without all the syrupy j**k they’re sometimes adding down there in Andalucia. Say this is between traditional old-school cognac and brandy de Jerez. Coffee liqueur, prunes, black raisins, burnt wood, chocolate… Mouth: fine, even if it would go into all directions, from pears to oranges through caramel, coffee and fudge. More ‘world brandy’ than cognac (let alone armagnac) on the palate. A touch of sugar in the aftertaste, not sure this is totally ‘original’. Finish: medium, good, sweet. Aged apple brandy. Sadly some sugar again in the aftertaste, which is a problem in my book. Comments: I was prepared for the very worst, but everything here proceeded pretty properly. Yes, phew. Right, you may – or not – know that I love walnuts. Well this is some kind of green walnut eau-de-vie made around Modena in Italy. That’s right, where they also make balsamico and red flat cars. This very expression was aged in ex-Silver Seal Demerara casks, so let’s just expect something pretty good. Colour: double espresso. No, really. Nose: terra pretty incognita, I would say, and yet we Middle-Europeans will feel at home with this one. Christmas cake, gingerbread, caraway, walnut wine indeed, cloves, blueberry jam, nutmeg, cinnamon rolls, spicy caramel, aniseed, Unicum and Jägermeister… Well I’m sure you got the drift. Mouth: it’s sweet, so it’s rather a liqueur, but a liqueur that I just love. Amazing notes of parsley, caraway again, cloves, spicy bread, fennel, celery, poppy seeds, carrot tops, lovage… And walnuts you may ask? Sure, fresh walnut skins! Finish: very long, sweet and herbal, with more caraway and wee notes of artichoke liqueur. How very Italian indeed. Comments: as some say, the Italians give extra-care to anything they put into their mouths. Mind you, that’s civilisation. Anyway, a wonderful kind of liqueur that I could sip while watching one of those stunning old Italian movies, such as one of my absolute favs, Antonioni’s Identificazione di una donna (S., please calm down – Ed). Let’s be clear and honest, I know more about nuclear physics than about vermouth – and indeed I know absolutely nothing about nuclear physics. According to vinepair, vermouth is ‘aromatized wine that's had its ABV boosted with some kind of neutral alcohol and been flavoured with a variety of herbs, botanicals, and spices’. I think Lacuesta in La Rioja, Spain, are excellent vermouth makers, far from those large brands that are churning out very average liquids (thought you knew nothing about vermouth, S.?). Colour: dark amber. Nose: any beginner, such as this humble human being, will think ‘Martini’. But this is better, of course, rather herbal, with many vegetables (spinach, artichokes, swede) and a curious sour/buttery side. What’s sure is that this is extremely dry and that I get no fruits and no sweetness. Mouth: more sweetness this time, red berries, raspberries, grenadine syrups, something pleasantly sour, some kinds of old oranges perhaps, then rather more spices and herbs, cloves, sage, tarragon (very obvious), aniseed, oregano, shallots… You could use this on oysters! Finish: not too long but this bittersweet sourness remains there. I imagine you could also spread this onto scallops, as if it was Noilly. No? Comments: not my world at all, and won’t even try to score this, but I think I’m going to finish this bottle. Very soon. Indeed, lol. Perhaps is it to be noted that this is some Highland Single Malt Scotch Whisky. Colour: gold. Nose: ah, good old-style malt whisky, rather mineral and leathery, then waxy and ‘stewed’. Some bouillons and soups too, but also some old cardboard. Not too sure… With water: the expected waxes and the usual dried dates and figs. Rather Clynelish? Not a big one then, and a vintage I’m not really accustomed to. Mouth (neat): very punchy, and actually excellent, with wee ideas of Pulteney if you ask me. So salty curds and creams, cold cuts, bitter herbs, grass… Tends to become a little bitter, though. With water: very good, Mr. President. Salty waxes, tangerines, and vegetables. Peas. Finish: medium, very salty. Some could also quote Oban. A touch of green smoke. Comments: you say this was totally anecdotal? You are perfectly right but mind you, the Rotary Club! If I remember well, this pot-still vodka is triple-distilled in Poland upon an old Russian recipe. Could as well be some kind of original Scotch whisky. Colour: white. Nose: no lumberjacking, no upholstery, no cabinetmaking here, this is barley spirit in its full, naked glory. In truth it’s all on fresh bread, early in the morning, when you haven’t eaten anything yet, while you’re hungry as hell. I’m sure you get the idea. Mouth: wonderful barley spirit, closer to the raw material than you could ever get in a regular whisky distillery (fitted with the usual port stills, let alone columns). Bread, bread and bread, with a touch of barley sugar. It’s a little sweeter than proper bread. Finish: only medium because of the lower strength, but perfectly cerealy and bready. I did not write breakfasty, did I?. Comments: always loved all these various Polugars; no exceptions here. Okay, this is grappa made out of Teroldego (a grape variety from Trentino) finished in a Demerara cask. What we sometimes call Saturday night plans (Friday in Scotland), but don’t we all need more fun in our lives? Colour: gold. Nose: so, and I mean so much nicer than the very whacky ex-Islay Grhisky! It is good grappa, slightly gritty and stalky, then fruity, rather on raspberries and grenadine. In short it’s a rounder, fruitier grappa. G.r.a.p.p.a. Mouth: grappa indeed, nothing fights it, it’s fruity, rather fresh, grape-y, and a little pinot-noiry I would say. I mean, it reminds me of marc de Bourgogne, not sure whether these grappas were made out of de-stemmed grapes or not. Finish: medium, good, grappa-y. Comments: I haven’t found much rum in this one. Not that I feel the need to write a letter, mind you. Good grappa. You may recall that I posted a rather mammoth series of Glenfarclas tastings on these vary pages last year. Mostly composed of Family Cask bottlings. Well, as fate would have it, my secret Glenfarclas contact in Germany has been raiding the warehouses once again and has comfortably surpassed himself this time. So, here’s yet another serialised Glenfarclas tasting. Like last time, we’ll go forwards by vintage and see if we can discern any further Glenfarclas-themed wisdom from amidst all this madness. Colour: pale gold. Nose: a bit shy at first, gentle whiffs of shoe polish, new leather, ink, clay and grass. Slightly austere. Some chalky lemon notes and hints of white flowers and fresh fabric emerge over time. Typical ‘Cadenhead dumpy’ style. Mouth: a tad dry and gritty. Some light cardboardy notes, which nods towards OBE. Then also some sunflower oil, plain brown bread and things like ground mixed pepper and asparagus. Not too great really. Finish: medium, slightly acrid, teaish and pretty austere. Comments: I can’t really find much too enjoy here I’m afraid. Not all these old dumpies were glories. I’m sure some dodgy OBE is at play but I’m even more certain this was just a bit of a duff dram. Could there have been a problem with the sample? I’ll have to revisit from a different bottle someday. SGP: 351 - 70 points. Colour: light gold. Nose: It’s a rather typically exotic and fruity 1970s style Glenfarclas. Lots of ripe fruits such as apples, banana, pineapple and guava with honey, pollen, green tea and sultanas. Although, it’s not quite ‘exuberant’ in its fruitiness like earlier vintages can be, there’s a real sense of elegance and restraint about the nose. Pretty typical excellent ‘refill’ profile. Hints of crystallised fruits, damsons and mirabelle eau de vie. Mouth: lovely balance between honeys, candied citrus peels, various herbal teas, wormwood, mint jelly and pressed wildflowers. Also some hints of cinnamon, nutmeg and clove. Finish: medium and on soft notes of tea, lemon balm, pineapple jelly and old Sauternes. Comments: in some ways it’s rather simple, but here that’s an asset as everything is beautiful and in its place and perfectly balanced. Easy and classical old farclas. 300 bottles from a hoggie after 36 years? Was it topped up? Colour: gold. Nose: this one opens on a rather fruity profile as well but here it’s things like prunes in Armagnac, dates, mushroom powder, hessian cloth, pollen and dried mango. All very lovely and giving the impression of being a tad ‘bigger’ than the ABV might suggest. Continues with baked apple, plum pudding and some fragrant sandalwood. Mouth: a nice balance between baked orchard fruits, custard, white pepper, menthol and fruit syrups. Hints of herbal extracts, soft tannin, lemon oils and a rising tropical fruit lushness on the back of the palate. Extremely quaffable stuff. The wood is present but poised and controlled. Hits of dried mint and green tea. Finish: surprisingly long and on caraway, dried banana chips, rosehips, lime jelly and black pepper. Comments: that sense of weight beyond its strength was sustained all the way through which is no mean feat for an older whisky. Another classical but great one. Sophisticated but also very easy. SGP: 631 - 90 points. Colour: light gold. Nose: a rather concentrated and syrupy fruitiness, like molten boiled sweets, juicy fruit chewing gum, pineapple jelly and some excellent aged mead. Opens up further with cornflakes, milk bottle sweets, a dusting of icing sugar and lemon infused olive oil. Also some earthy mushroom notes, old wine cellar and things like chamomile and bergamot. A rather more complex example that’s ably supported by a perfect natural strength. You can add plums, sultanas, apple crumble and chocolate limes. Really excellent! Mouth: superb texture and concentration - very syrupy and gently oily. Hints of pear eau de vie, creme de menthe, rum n raisin ice cream, raspberry jam and soft waxes. There’s also herbs, mulled wine and chocolate covered marzipan. Lots of glazed and crystallised fruits everywhere, along with some nibbling peppery notes. Finish: long, rather orangey and abundantly fruity. Citrus pith, olive oil, mint, apricot jam and dried thyme. Comments: A notch higher still. There’s a level of complexity here that really sings alongside a perfect natural ABV. 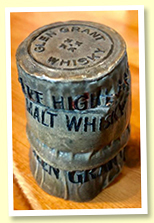 A great and humble wee cask. Colour: light gold. Nose: there is this shift in character I’m really starting to notice with any Glenfarclas as soon as you hit 1980 and it’s on display rather vividly here. In place of these more luscious and exuberant fruit qualities it’s really more towards breads, honeys, light hoppy notes, dried herbs, chalk, ink and a few stewed fruits - perhaps a light gooseberry note. There’s also a more funky earthy note in the background which is slightly dundery. Also straw, muesli and freshly filled malt bins. Very nice but notably divergent from the previous decades’ characteristics. Mouth: rich and slightly drying with big notes of heather honey, plum liqueur, pear cider, dried cranberry, lime oil, light sootiness and hints of mineral oil and sunflower seeds. Slightly leathery and animalistic as well with something approaching a sweaty note which feels like it originates from that same funky aroma on the nose. Very unusual, but also very entertaining and fascinating. Finish: long, slightly woody, green pepper, hints of ointment, ink, carbon paper and some green chartreuse. Comments: These early 80s Glenfarclas seem to have something of a character all their own, not up to the same pure pleasure levels of quality as their late 70s siblings, but they are extremely worthwhile and intriguing drams well worth seeking out I’d say. SGP: 461 - 88 points. A sister cask, this should be interesting. Colour: light yellow. Nose: lots of freshly baked breads, sourdough starter, veg stock and curious things like roast chicken, bay leaf, tarragon and wild mushrooms. A meal in a glass! Goes on with baking soda, cornbread, ginger biscuits and a rather dry and peppery waxiness. Things like wax paper, canvas and old jackets. Freshly rolled oats, savoury flapjack, trail mix and toasted mixed nuts. Fresh, clean and getting increasingly cereal in profile. Mouth: full and syrupy in texture. Lots of toasted almonds, coconut oil, buttered bread, lemon peel, citrus infused darjeeling tea, mint leaf and fir liqueur. Touches of fennel seed, caraway and miso broth. Again this rather delicate waxiness in the background with similar peppery notes. Finish: long, earthy, all on olive oil, mixed shades of pepper, lime zest, white truffle and dried herbs. Comments: cleaner than its sibling and very good. A more technical and textbook early 80s Glenfarclas. I like the dryness, it felt very crisp and appetising. SGP: 561 - 89 points. Colour: copper. Nose: a rather lean and sinewed sherry profile. Light notes of damp leaves, toasted almond flakes, hints of mushroom powder, lemon pith and a few pieces of crisp pancetta. Develops towards a deeper, bassier earthiness. Pine cones, leaf mulch, walnut oil, mineral aspects and cola cubes. Very good but overall a tad shy perhaps, not that modesty is a flaw by any means. Mouth: a more textbook profile of raisins and sultanas in old cognac, black pepper, strong tea, mint liqueur, caraway, red liquorice, cola syrup, cocktail bitters and aniseed. Excellent balance and a good strength that delivers texture and flavour very well. Salty almonds, muesli, toffee and salted caramel ice cream. Finish: long, spicy, peppery, bitter chocolate, mint, cough medicine and lemon balm. Comments: I find the sherry profile surprisingly prominent considering it’s a 4th fill cask. However, I’ll not grumble as it’s excellent and treads a lovely line between distillate and cask. Colour: gold. Nose: prunes, calvados, Armagnac, poire williams - really a mini convention on French fruit distillates. Also slightly grassy, hints of coconut, lime, hessian, crushed nettles and toasted cereals. Savoury flapjack, sage, mint tea and things like muesli, chopped dates and oatcakes. Also quite a few fresh breads and mixed seeds. Gets increasingly autolytic with time. With water: a little spicier but also softer at the same time. Chalky mint, lemongrass, white pepper and a nice olive oil note. Mouth: surprisingly sweet initially, lots of honey, mead, heather ale, cornflour and icing sugar. Gets more biscuity, gingery, nutmeg, olive oil, hessian and soot. A touch of wax and some white pepper. With water: soft garden fruits such as apples and pears, lemon thyme, dry cider, lemon and brown bread. Finish: medium in length and rather citrusy, delicately herbal, light peppery notes again and more bready, autolytic aspects. Comments: It’s lovely whisky, but I’m not sure the thrill is worth the price. These bottlings are rather expensive. But, of course, we don’t score prices on Whiskyfun. SGP: 651 - 90 points. Colour: white wine. Nose: more mineral and towards things like sunflower oil, toasted seeds, cereals, yellow wildflowers, pollens, honeys, dried mint, buttered toast and olive oil. Fragrant, gentle and very pleasant. Various light and fresh herbal notes such as chopped parsley, marjoram and chives. A very light background note of hessian, mineral oil and beeswax as well. Rather sophisticated and charming - quite out of character for things from 1985. Mouth: olive oil, yellow flowers, chestnuts, sunflower seeds, white bread, asparagus, black pepper, lime zest, gooseberry and lychee. Wee hints of cough medicine and gentian root, then slightly salty liquorice and fresh butter. Finish: good length, lemony, slightly yeasty, sooty, peppery and nicely drying. Comments: The ying to the other 85’s yang. A tad drier and more autolytic and mineral overall but still superbly drinkable and of equal quality. Very happy with these two, not often you find good 85s. SGP: 561 - 90 points. SGP: 572 - 92 points. 100 proof (57.1%) has become a kind of iconic bottling strength over the years and I often felt that its power sheltered many great and historic single malts from the changes of old bottle effect that often seem to affect lower strength bottlings more obviously. G&M had many, many great examples at this bottling strength, but also other bottlers too. Colour: light gold. Nose: richer, fatter and more buttery with a light sweetness of honey creeping in. With a little time it gets sootier, saltier and a rather fat and swollen waxiness really begins to emerge. Things like wax crayons, putty, clay, olive oil, matchboxes, ink wells and lemon-infused tonic water. It bears many similarities to the 15 UP version, only with a sense of greater age and an obviously punchier strength. With water: the most elegant pepperiness that includes horseradish, watercress and paprika. Also white truffle, more flinty smokiness and things like freshly bailed hay and milled oats. Mouth: intensely peppery, spicy and mineral. Lots of sunflower oil, plum eau de vie, waxed canvas, lamp oil and old herbal liqueurs. Many white flowers, pollen, salted honey, hessian and a hint of buttery porridge. Really great but also rather demanding in a compelling way. With water: I can’t get away from this impression of white stone fruits, things like lychee and apricot but also hints of gooseberry and even star fruit. Although they are kind ‘dry’ in profile, rather like they appear in eau de vie form. Also kind of mustardy and sooty. Lemon oil and dried mixed herbs. Finish: long and vigorous, full of vapour rub, peach stones, almonds, light earthiness and citrus rinds. Comments: superb complexity and character. Although, while its more demanding than the 15 UP example, it combines this kind of intellectual side with raw quality in an undeniably thrilling way. And not a whisper of OBE. You really get the sense you’re as close to the original character of whisky when it was bottled as it’s possible to be in this day and age. SGP: 571 - 91 points. This one being a ‘slightly’ later example based on the glass code and bottle shape. But probably only by a matter of a couple of years at most. Colour: straw. Nose: this one prickles with minerals, wet pebbles, flints, limestone, clay, straw, hessian and white pepper. There’s something farmy amongst it all as well, plenty of lemon and mixed citrus peels, some mint tea, a twist of old rope and a dollop of furniture oil as well. There’s also a sense of freshness in the form of all these rather crisp and toasty nut, seed and cereal aspects. Similar to the first 15 but missing the more punchy buttery and oily aspects. There’s still a lovely thread of wax running through this one though. With water: earthier, slightly more vegetal with white asparagus, sootier and with a slightly fatter and oilier cereal profile. Mouth: once again this is lively, petroly, mineral, superbly peppery, oily, waxy, camphor, mint, juniper and things like hawthorne, bracken and clover. Lime jelly, lemon, herbal teas, cough medicine. Typically great. With water: perfect! A beautiful mix of white fruits, waxes, herbs, cereals and soft, peppery warmth. Just lovely. Finish: long, waxy, lemony, herbal, oily, and gently fruity. Comments: The word for these bottlings is undoubtedly ‘charming’. You just can’t help but be seduced by this mix of gentle power, charisma and complexity. Honestly, these old Glen Grants really are terrible! SGP: 661 - 92 points. What can I say? After that Mortlach 1938/2008 (WF 88) and that Glenlivet 1940/2010 (WF 91), G&M are now having this 1948/2018 Glen Grant that was bottled at some very reassuring 48.6% alc./vol. But no matter how hard they try, they’ll never manage to make me… blasé (may we still try to joke a little bit even in these most precious and rare moments?) Colour: gold. Nose: could some extremely old whisky be kind of immediate? Almost instantaneous? Shoe polish, chestnut purée and honey, furniture wax, mocha fudge. That’s all… for two good minutes. That’s already quite a lot mind you, those are beautiful and very coherent aromas. And fresh, at that! But you ain’t seen nothing yet (thank you BTO), as slowly, delicately, and with much precautions, some wee touches of liquorice caramel, toffee apples, thin mints, tar, morels or badian manage to make it to our nostrils. Especially thin mints, that’s rather specific. The whole’s extremely elegant, more for the glove compartment of a Bentley than for that of a… say a Corvette. Oh forget about that last part. Mouth: success! I always tremble when taking the first drop of some very old whisky, because the odds of it being too drying and tannic are always very high. Not here, even if there’s a good share of herbal tea (thyme, primarily, also cinnamon – that’s the oak). The great news is that the fruits are still alive and kicking, with cherries and oranges playing first violins, then the very same toffee apples as in the nose, and a further development on polishes, waxes and even a little tar. Shall we call it ‘smoky’? Perhaps not quite. Wee touches of camphor as well, and the tiniest touch of sour tea (no, no yak butter here) from the old oak. Finish: medium, rather on all things apples, coated with caramel and just a little meringue. Perhaps, the meringue. Comments: much less fragile than I had thought. Now, let’s remember that Robert Plant too was born in the year 1948. You’re right, and Stevie Nicks. Good, they were all winners today, weren't they? Cadenhead have had an excellent 1992 at 17 yo that we had tried back in 2009 (WF 88). How’s that for a #10yearchallenge? Colour: straw. Nose: it’s rather one of those slightly buttery, almost-feinty-but-not-quite-feinty ones, with quite a lot of chalk arising, as well as some hay and rubbed citrus peel. Gets then more classically fruity, with greengages and gooseberries, and rather less lemons and tangerines than in other Bladnochs. I think. Mouth: there, here they come the tangerines and mandarins, together with their peels and a very distinct leafy/peely grassiness. Some lemon too, a touch of chalk again, herbal teas (well, green tea) and wee touches of gentian, kiwi, melons and gentian liqueur (Avèze, Suze and stuff). Excellent. Finish: rather long, with an utterly perfect balance between citrus, tea leaves, and chalk. Comments: absolutely perfect, and very Bladochian. 1970s-1980s Bladnoch, that is. It’s been a long time since we last tried such glorious and panache-y Bladnochs! In my experience, some of Springbank’s sherry casks can be a tad... inconsistent. Let’s see how this one fares... Colour: amber. Nose: pleasantly leafy, earthy and fudgey to start. Some salted caramel, praline, cough medicine and camphor with a few dates strewn in the background. Also some milk chocolate covered digestive biscuits and a touch of menthol and pipe tobacco. Mouth: rich, clean, gently muscular and full of salted almonds, cured meats, mineral oil, light leathery tones, unlit cigars and black olives. Really excellent and very clean. Much more character than I usually find in Hazelburn. More of these cough medicine notes, some strawberry liqueur and a drizzle of mint cordial. Very good! Finish: good length, full of leaves, prunes, fig jam, delicate ointments and slightly salty lemon notes. Comments: A bit of a surprise, but also not really a surprise. A lovely and perfectly quaffable composition of good sherry casks. Colour: dark amber. Nose: anything distilled at Springbank after, say 1990 and filled in heavy sherry might be mineral to the point of being a little sulphury, and that’s certainly the case here, with whiffs of burnt candles, struck matches and black truffles, as well as quite some leather. But we’ve seen some much more extreme than this, so we’re fine. Also aspirin tablets, tobacco, pinewood smoke and quite a lot of dried beef, Grisons meat-style, or bresaola if you like. With water: really a lot of tobacco, straight from the plantation. Mouth (neat): it’s really very big for Hazelburn, and I wouldn’t have cried foul, should you have said this was actually Longrow. Bitter tobacco and leather, salty meats, black tea, then black dates and raisins as well as these mineral/sulphury notes yet again. With water: bitter oranges, cinchona, artichoke. Salty-coffee-like but not as emetic, if you see what I mean. Finish: long, even saltier, with notes of plasticine and more bitter oranges. Comments: rather heavily rustic, I would say, with quite a few clashes happening both on the nose and the palate. But it’s got something rude that’s pretty pleasant. This one came out in November last year; right, that was 2018, remember? Colour: straw. Nose: ah yes, this pretty lactic, rather fermentary profile that we all rather enjoy, only toned down. Fresh croissants early in the morning, fresh Moroccan bread, sawn plywood, a drop of engine oil, stewed apricots, a wee bit of Swiss cheese (say Fribourg), meadow flowers, some wackier herbs and roots (verbena? Wormwood? Mugwort? )… In short, this one’s clearly unusual, in a good way. With water: oh lovely, cooked asparagus and chicory with a little liquorice sauce. Should anyone ever try to cook that. Mouth (neat): fantastically rooty and citrusy. I’m sure they have these kinds of products around Thailand or Vietnam. With water: extremely good, with stunning citrus and that proprietary ‘fermentary minerality’. Finish: long, wonderfully bitter (Seville oranges), with just ideas of oak shavings in the back of the background. Comments: looks like Springbank keep failing at making Hazelburn their ‘lighter’ sibling. I think no one’s ever going to complain, since Hazelburn is brilliant whisky. Looks like I won this time! Colour: white. Nose: love most of what Savanna are doing, but I find this pretty low-profile, not very intense in fact, with rather notes of mild cane syrup, pears, and only touches of grapefruits and leaves. I had expected something, well, something a little more intense, precisely. Mouth: again, rather all on cane syrup (this is molasses-based rum), with touches of lime and a very moderate chalkiness. A touch of quetsche eau-de-vie, perhaps. Finish: short, with a little sugar, and a grassier aftertaste. Comments: a bit surprising. Not one that would sip without any additional ingredients, although you would understand what they were aiming for when they created this cuvée. I liked their molasses-based Lontan way better (WF 82). This is pure cane juice, not molasses. Should be interesting… Colour: white. Nose: oh yes, there’s more profoundness, overripe fruits (pink bananas), more obvious sugarcane, touches of aniseed, verbena, dried tangerine peel (Chen pi), lime… I like this one thousand times better! At least… It’s also a little cachaça-y, I would say. Mouth: excellent, green and grassy as it should be, then more secondary, with some liquorice roots, touches of olives, cumin seeds, a discreet tarry side, and simply sugar cane juice. This one you could sip! Finish: rather long, rather on grass and liquorice, plus lime again in the aftertaste. Lovely. Comments: some excellent full-bodied white rum, and Savanna’s real place in my book. Didn’t we just mention cachaça? This one’s said to be kept for months in open containers to help create more esters, let’s see if that worked… Colour: white. Nose: a wonderful earthy and brine-y cachaça indeed. There are more olives and anchovies than in the most extreme mezcals (well, quite), and more benzine than in a young Ardbeg. Also stewed peas and green bananas, this is all rather splendid despite the low strength. Now as they say, Pétrus is bottled at an even lower strength. Ha. Mouth: nah, a few extra degrees would have been welcome, as I’m finding this a little watery and weak. A crying shame because all the rest is pretty perfect, beans, lime, olives, walnuts, chestnut honey, ashy earth, maple syrup… Finish: yes, really, a shame, this shouldn’t be this short. Lovely touches of salted tequila in the aftertaste, indeed, a crying shame. Comments: super juice, this, but please, 42 or 43% vol. would work much better. Taxes? Wat taxes? A white cachaça that’s aged in oak and balsa wood, all pretty inactive I’d wager. Unless this got discolored, having said that. Colour: white. Nose: a different cachaça, rather more on caraway and cloves, fennel seeds, lime, and a touch of green oak. It’s very fresh, perhaps a tad simple after the much deeper Abelha? Mouth: a little drier and more on lemon than the Abelha, with some grass, a touch of pineapple, and a rather moderate cane-iness. Once again, the low strength is rather a handicap on the palate. Finish: medium, perhaps not totally clean enough? Grass. Comments: it’s rather a good cachaça, actually, but it’s a little weak, I would say. Oh well, more cachaça, why not? Colour: white. Nose: not much, this one being light as a feather, but there are pleasant, albeit rather distant whiffs of lime juice and angelica. It’s also rather tequila-y, as if it was rather made out of agave. Mouth: it’s okay but frankly, there isn’t much happening. A soft, grassy and lemony spirit, with a little ethanol in the background. Now don’t get me wrong, it hasn’t got any obvious flaws, but it’s probably not designed with us malt enthusiasts in mind (seriously, good for them – why would they have done that?). Finish: short, a little absent. Alcohol and a little lime. Comments: it’s okay. Where have I put the lime juice? This one double-distilled in the Sao Paulo area and aged for a few months in tropical wood. They’re talking about high purity and veganism, mind you. Colour: white. Nose: I had hoped there would be more happening because of the (marginally) higher strength, but I would guess they ‘purified’ it too much. A little aniseed, apple juice, and mint. Perhaps. Hello? Mouth: sweet and a little earthier, a little too rounded, and lacking precision. A curious meaty/burnt side and quite some saccharin, so I shall pass. Finish: medium, unfocussed, grassy and slightly burnt. Comments: a lovely bottle, but the song was not worth the plumage, I would say. I thought their white ‘Ter Rouj’ was pretty good (WF 80). This bottle has something of… Kenzo? Colour: white. Nose: pure grassy, slightly ‘rotten and hot’ white agricole, in short exactly what we were expecting. Fermenting hay, vesou, damp earth and clay, overripe bananas, a touch of varnish and these very elusive hints of acetone that aren’t unpleasant at all… In short, all good and nice so far, this has ‘guts’. Mouth: it’s a little gentler than expected and just a tad sugary, otherwise all is fine, even if some tasters could have thought this was ex-molasses rather than cane juice. Bananas, pink grapefruits, sugar. Finish: long, a tad grassier, which is welcome. Hay and orange skins, a touch of litchi. Comments: I would say this one would benefit from a little lime juice and a lot of crushed ice, but indeed one can sip it just like this. Oh common, we need a benchmark! Good, it was a tie between Marie-Galante and Jamaica, wasn’t it. Both thundering spirits! 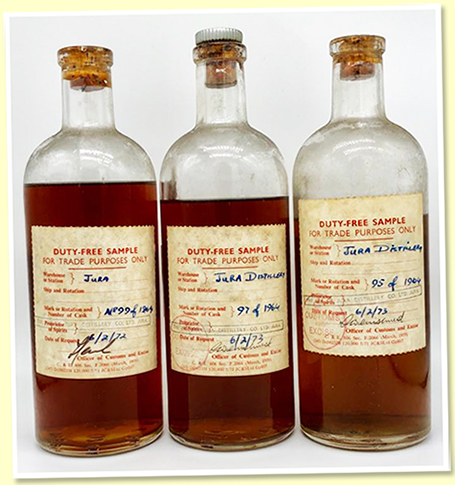 We don’t really score cask samples on Whiskyfun, but for wee, one off nuggets of history such as these four Jura, I think exceptions can be made. These bottles were acquired recently at auction by our great friend Phil Thompson of Dornoch Distillery. They came from the estate of a Mr Anthony Riley-Smith, a Yorkshire brewer who was also an estate owner on the Isle of Jura. He was one of those responsible for the restarting of Jura distillery in 1963 after a very long period of closure since 1901. Extremely cool that we could sample some of the very first new make spirit to run from Jura’s new stills in 1963. Colour: white. Nose: we’re a long way from most contemporary new makes, but of course time and air will also have played a role here. I’m reminded of things like asparagus eau de vie, bouillon, fennel, fungus, leaf mulch, caraway, long-matured champagne, hummus and wild garlic. Extremely earthy, mulchy, tertiary and organic in style. Hints of funny things like crayons, papyrus paper, old mead and emulsion paint. With a tiny drop of water... interestingly this goes immediately opaque once water is added, probably suggesting this is not the most technically pure of new makes. Gets funkier and earthier still, more towards shoe polish, mineral oils, some menthol oils, canvas and something like pine air freshener. Hugely entertaining and kind of labyrinthian. Mouth: immensely fatty, greasy and oily. Seriously farmy but also with strangely coastal things like molluscs and grilled limpets. More clean vegetal aspects along with some meaty, beef stock notes. Shoe polish, gravel, tar, limestone - totally whacky but also kind of brilliant. The alcohol is still pretty impressive! Again with a tiny drizzle of water... moving further towards putty, earth, elastoplasts, lemon jelly, mint, pine liqueur, ointments, mushroom powder and umami paste. Kind of cough syrupy and with this pervasive petrichor character. Really starts to become rather animalistic with these notes of stables and horse sweat. It also displays a definite feinty edge, although it’s not overwhelming. Finish: medium-long and rather leathery and still extremely fatty, organic, slightly composty and again pretty mushroomy and fungal. Sounds pretty awful but it really isn’t. Comments: Probably rather dangerous to drink a lot of, and certainly this is a funky, sweaty, meaty, vegetal and rather medicinal distillate. Totally fascinating to try, what it reminds me most of is a good eau de vie that has been matured in a demijohn for a long time so that you really start to feel the more organic and oxidative complexities. Would be fascinating if some smaller distillers just put some of their new make into glass for a couple of decades to observe its evolution in such a way. What this also brings to mind is how old distillers would often say good new make shouldn’t necessarily be drinkable straight away, but rather an uglier, more rough and ready profile would mature better. After tasting this, and remembering an old 1960 Balblair new make as well, you can begin to really understand this. This is new make that certainly bristles with a sense of potential. Given how great many of the 60s Juras were when mature it’s not surprising. SGP: 372 - no score. Colour: deep amber. Nose: the initial aroma is surprisingly suggestive of an old Karuizawa with these big notes of spiced firecrackers, strawberry tobacco, incense and ground black pepper. There’s also fresh espresso, morello cherries, black tea, cough medicine and a very earthy and mushroomy streak running through it ( rather reminiscent of the mushroomy aspects in the new make). You can also add coal scuttles, mint leaf and, with a couple of minutes breathing, things like freshly starched linen, freeze dried raspberries, cranberry and some rather salty aged Madeira. An immense sense of power but also really excellent! With water: now we’re really on camphor, stewed raisins, corned beef, lapsang souchong and mixed salted nuts. More black pepper and drops of rosewater. Mouth: a surprisingly relaxed delivery although it’s still very much on incense, pot pourri, dried lavender, mixed dried herbs, wasabi, soy sauce, lime oils and various fruit liqueurs. Some spiced beef stock, aged rums, fruity red chilli and pomegranate molasses. Tobacco leaf, damp earth and old wine cellars. Superb complexity and power! With water: red and dark fruits, more liqueurish, sweeter, easier, more herbal, earthier and more sooty and rooty. A curious mix of things like of limoncello and lamb stock. Pretty excellent all round really! Finish: long, superbly taut, leathery, salty, nutty, herbal, lots of aniseed and extremely resinous with some big, slow-fading rancio notes. Comments: I’d be curious to know if Jura and Karuizawa ever shared a sherry cask supplier, there’s really something reminiscent of that style going on here. Oh, and in case I didn’t mention, totally superb, punchy, complex old school sherried malt whisky. SGP: 671 - 92 points. Colour: deep amber. Nose: we’re in very similar territories, only this one is slightly straighter and more chiselled with a gently austere concrete aspect at first. Opens up with lemon and orange peel, bergamot, heather, pot pourri, light notes of Moroccan spices and then things like dates, dark fruit cake, tobacco leaf, fir liqueur and cheery sweets. Some red liquorice, ripe melon and paprika. Lovely, if a little more elusive than cask 97. With water: dry earth, pear eau de vie, black pepper, tiny glimpses of tropical fruits and another elusive wee melon note. Also chamomile and chilli pepper. Mouth: the inversion of the first one, here the power is on full blast on the palate whereas it was the nose which was a tad more gentle. This is a big hodgepodge of lime, chilli, damp earth, mushrooms, black coffee, sultanas, spice cake, cinnamon, cloves and rosewater. Also cherry liqueur, white truffle, lemon oils, throat sweets and tar resin. A big dollop of meat stock and toasted fennel seeds as well. Superb! With water: turmeric, velvety earthiness, bitter chocolate, praline, nutmeg and cocoa. Really great with water now! Finish: long, gently earthy, salty, leathery, meaty and with light red and citrus fruits throughout. Really quite close to cask 97 now. Comments: I had it at 90 in the beginning but the palate and a little water elevated it a solid extra point. Again it’s the complexity that strikes the deepest impression. Colour: amber. Nose: this one opens on hessian and cough syrups. Lots of cherry throat sweets, hints of dry roast peanuts, toasty cereals and fruity muesli with plenty of dates, dried cranberries and perhaps a wee shot of espresso on the side. Not that I’d suggest you drink this with breakfast! Some lovely notes of plum eau de vie, salted almonds, frying bacon, blood orange, wee briny touches and ginger biscuits. Some wild flowers as well and notes of heather ale. Perhaps a refill cask rather than first fill? With water: ointments, breads, linen, cough syrups, bay leaf, bitter ales, ink and a gentle coastal freshness pulsing in the background. Really harmonious and enchanting. Mouth: beautiful delivery! All on heather honey, crystalised fruits, mirabelle, quince, raisins soaked in cognac, sultanas, Dundee cake and earl grey tea. Quite a departure from the other two, more of a gentle natural sweetness and wonderfully complex fruit profile. Lemon peel, fresh breads, lightly yeasty notes, linseed oil and cloves. With water: lemon infused tea, chocolate lime sweets, wee notes of caraway liqueur, camphor, old wine cellar, rosehip, jasmine and truffle oil. The kind of complexity that can be quite demanding of your attention and time but is extremely rewarding. Finish: Long, oily, full of citrus fruits, gentle sea air, tea biscuits, lightly hoppy notes, wood resins, fruit oils and a lick of mint. Comments: My favourite of the three I’d say. I loved the power of the other two but this one just has something really charming about it. Feels like a good refill cask that has boosted the lighter, more ethereal and fruity aspects of the distillate. Just needs time and a little attention is all. SGP: 651 - 92 points. Many thanks Phil & Simon! A micro batch at very high strength, that may be just enough to fill the tank of a Corvette. Colour: straw. Nose: typical, MoM also had some very young Aultmore, for example, that was super good because of some very good, very active oak. All is fine here, seemingly. Breads, pastries, preserved fruits, malt, cereals… But boy does it burn! With water: burns less, the rest remains the same. Tinned plums, a wee bit of wet chalk, some toasted oak that goes towards coffee beans. Mouth (neat): very creamy, but that may be the high alcohol. Sweet spices, cakes, syrups… With water: frankly, this is excellent, full bodied, spicy and rounded, very caky. Cinnamon rolls, Danishes, white pepper. Good, the oak might be a little loud, but it doesn’t quite lay down the law. Finish: long, almost syrupy, and extremely caky. Comments: as good as it gets at just eight years of age. Good wood’s been in use. Colour: white wine. Nose: a fresher Craig’, with less oak, less vanilla, less cakes, and more grapefruits and earthy malt. I tend to like this one even better – so far. Oat cakes. With water: oh, chestnuts, moss and wild tea leaves! And raw malt! Something’s happening in there… Mouth (neat): closer to the MoM, but with more lemon curd, marmalade, unripe kiwis, rhubarb… I really enjoy this very tart style, but given the high strength, let’s not try too hard just now… If you don’t mind! With water: super-good, with a pure full bodied maltiness, biscuits, sponge cake, a salty touch (wow), lemon curd, angelica, Fernet-Branca, verbena… As they say in English classes in France, I do am impressed. Finish: long, creamy, caky, citrusy, liqueury, perfect. Comments: this is superb. Nine years old and a fair price (I suppose), and a malty profile that is just perfect. Plus, as we used to say twenty years ago, at such high strength there’s more in the bottle. More Scottish malt that transited through China. Our friends seem to be catching excellent casks, I have to say. Colour: gold. Nose: new wellies and fresh almonds, halva and turon, rubber bands, pecan pie, praline, Assam tea, Swiss milk chocolate, and really a lot of hay. Wonderful so far. With water: oh, grapefruits, Timut pepper, drops of lapsang souchong, and new wellies in all sizes. Mouth (neat): it’s mirroring the nose, with just as much ‘good’ rubber, some perfect fudge and butterscotch, packs and packs of halva (peanuts or pistachios), and the most perfect, most luscious chocolateness. With water: no, careful, it wouldn’t take water too well. Gets a little sour and bitter – oh just drop water, so to speak! Finish: long, pleasantly bitter, leafy and leathery. Comments: the rubber caused a few troubles here and there, but other than that, it’s a brilliant whisky. How a Port finish would become part of an ‘Exceptional Cask Series’, I don’t quite know. Perhaps in a marketing office? Colour: gold. Nose: erm… Strawberry juice and old rusty tin box, raspberry vinegar, cranberry jam (the one they would serve with grouse), old copper, pot-pourri, rotting oranges… Bizarre bizarre, how bizarre… With water: sour juices and rusting metals, plus burning tar. Mouth (neat): what-is-this? Stale Fanta and blackcurrant syrup, plus kid’s mouthwash and… well, I don’t know, I really don’t know. With water: wait wait wait, Port, that means Portugal, and doesn’t Portugal lead to… José Mourinho? Was he involved in this in any kind of way? That would explain mucho! Finish: weird. Comments: some kind of industrial accident, I would say. But there is some fun to this, after all, and doesn’t it take all sorts to make a world? But Craigellachie, seriously, have you really been behind this space-y oddity? John? Steve? Paul? Louis? Emma? Louise? Frank? Jeannette?, Donald? Peter? Kate? Susan? Stephen? Mark? Isabel? Mike? Mick? Keith?... … … But then again (and again), only one single man’s opinion and I'm sure some will adore this crazy rock and roller. The fact that our friends in Melbourne Downunder have partially used some red wine casks here does not obligatorily mean that this will be a complete disaster. Let’s check that… Colour: deep gold. Nose: starts with toasted oak, goes on with cinnamon rolls and chocolate, and keeps going on with burnt cakes, especially brownies. Roasted malt, Ovaltine, prunes, a touch of blackcurrant jam that gives it a faint pinot-noiry side… But it’s clearly not very red-wine-y, total great news here. With water: fruitcake and candied cherries. Mouth: a tad more grape-y, almost merloty at first (Saint-Emilion isn’t far, I mean, as far as flavours are concerned), then rather oakier, with more roasted malt and black tea, black pepper, other cinnamon rolls, sour teas, slivovitz… With water: nice, fruitier. Blood oranges, redcurrant jam, more cherry jam… Finish: medium, rather on cherry cakes and battelman. Comments: my fears were unfounded, it seems. Pretty good whisky despite the heavy-ish casks that have been used. Colour: gold. Nose: rather unusual at first nosing, with some almond milk, hand cream, leaven, broken branches, linseed oil… Rather goes toward autumn leaves after that, peels, celeriac and other rooty things, perhaps gentian roots, ale… Mouth: firm and characterful, earthy, a tad yeasty, with more ale, cider, and bitter apples. Gets fruitier after just one minute, rather on more apples, as well as pears and greengages. Finish: long, rather on plums and vanilla this time. Oak-aged sloe eau-de-vie. Comments: high malt content, not sure there’s much grain inside, unless that grain was matured in very active oak. As expected, quality’s pretty high here. This baby’s 38 months old and was partly matured in virgin Garryana oak, a species that grows in the Northwest of America. I had rather enjoyed the first edition back in 2016 (WF 82). Colour: gold. Nose: starts with fresh almonds and sour cream, which is a tad bizarre, and gets then extremely bready, which was to be expected from Westland. Spiced bread, Stollen, mustard, then cake, Mars bar, Ovaltine, and many spices from new oak, especially the usual nutmeg, cinnamon and ginger. With water: a little caraway. Mouth (neat): oranges, cakes, spices, and really a lot of cinnamon and chocolate. With water: more oak comes out, sawdust, oak shavings. The good news is that that would come together with oranges. Finish: medium, never too drying, which is quite a miracle. Saved by the oranges. Comments: the oak’s a little loud for me here, I usually prefer Westland’s single casks. But this remains very good. According to the numbers this should be a vintage 2010, am I wrong? Colour: deep gold. Nose: no peat bomb, rather many tobaccos and dried fruits at first, Virginia, figs… Also some camphor, eucalyptus, thin mints, drops of sour soup, miso, then a little patchouli, old wardrobe, perhaps even one or two small mothballs… This really is a lovely, rather complex nose, and yet another impressive Kavalan. With water: rubbed mint leaves, bandages, various embrocations and balms, Wulong tea (Taiwanese, naturally)… Mouth (neat): more peat for sure, plus massive amounts of grapefruit juice, fresh coriander, and an unexpected margarita-y side. That’s right, tequila. Green pepper. With water: leafier. A touch of aniseed as well, leaves, seeds… The grapefruits are still there, but there’s also a little cranberry juice. Finish: medium to long, mentholy, citrusy. Comments: it’s very moderately peaty, and quality’s very high. We’ve personally known some Glen Gariochs that were a bit like this. Angus has already tried this one but how could I not try the first Daftmill ever as well? Loved the Summer Batch, having said that. Since Angus has written a fashionably long note, I’ll try to keep mine very short. Colour: pale gold. Nose: fully on barleys and assorted cereals, plus a little lemon curd, porridge, Moroccan bread, and a drop or two of artisanal limoncello. So everything is in place. With water: what I had already noticed in the Summer Batch: Rosebank! Mouth (neat): it really is very good, balanced, firm, with perfect breads, pastries and cereals, plus lemony touches and softer spices. I think it’s great that they could and have been willing to wait before issuing their first expressions. The citrusy side is particularly admirable. With water: swims like a champ, remains perfectly balanced, bready and lemony. They have some lemon cake aboard the TGV in France and… oh, please forget about that. Finish: medium, clean, bready and lemony. Haven’t I just mentioned Rosebank? Comments: excellent.